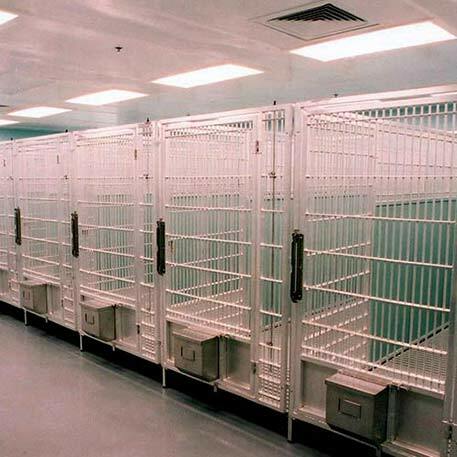 LGL combines innovative ideas and fabricating process to offer raised floor kennel systems, self-contained kennel systems, and existing floor kennel systems. Every effort is made to provide the finest kennel systems that are safe and comfortable for the animal as well as providing a unit that is easy to clean and maintenance free. Our sales staff and engineering department, with years of experience, is always available to assist in designing your kennel facility from the room layout, to the floor slope, to the finished product. Please do not hesitate to contact our office so we may assist you, your architect, or your contractor in putting in a kennel system of which you and your clients will be proud. This facility uses the raised fiberglass slatted flooring while making one section in the run a solid section. This solid section serves as a resting bench by providing a warm, smooth surface for the animal. A vinyl coated flooring is an alternative option. Available in 3/4" spacing and 3/8" spacing between slats. Poly Flooring is an alternative option. A raised floor system keeps the animal up off the floor; therefore, keeping the animal cleaner while providing a warm surface on which to lay. The fiberglass flooring comes in different sizes, surface grits for texture, and space widths of each slat. The raised floor kennel system will elevate an animal off the floor. Works well for leased spaces where trench drains and sloped floors cannot be used. 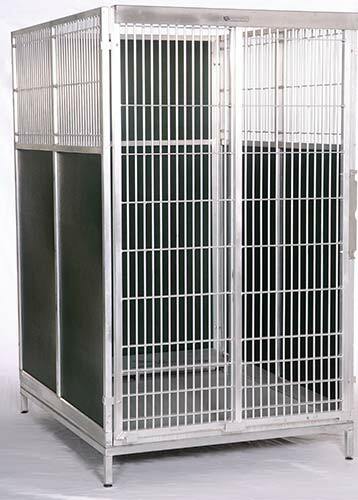 A self-contained kennel system is easy to plumb and easy to clean. This example of a modular kennel system utilizes the existing floors with an adjustable vinyl base seals that prevents washing excrement from one kennel to another, eliminating cross contamination. The telescoping base channel adjusts to match the slope of the facility floor. The gates pictured are a combination of glass and rod with both aluminum and polyethylene privacy panels. 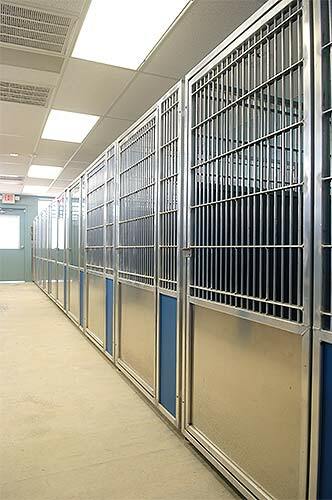 The existing floor plan can be used wisely with a custom-built kennel system.